[ Lord George Hamilton, Conservative politician. ] 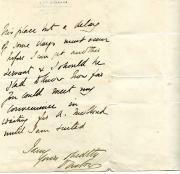 Autograph Letter in the third person to Percy Noble, recommending Ernest Peeke as a footman. On letterhead of Deal Castle, Deal. 25 February 1910. [ Arthur Joseph Munby, diarist and poet. ] Autograph Letter Signed ('A. J. Munby') to the bookseller Bertram Dobell, regarding two lost postal orders. Ripley, Sussex. 23 September 1894. 4pp., 12mo. Bifolium. In good condition, lightly aged and worn. The letter concerns two missing postal orders, regarding which Munby reports that he has made enquiries with 'the Ripley postmaster'. He discusses the question, giving the numbers of the postal orders, and writes: 'The postmaster tells me that, as the Orders were crossed, the G. P. O. will (unless by any chance the Orders have been cashed) repay the £1. 4. [ Richard Grosvenor, 2nd Marquess of Westminster. ] Autograph Letter Signed ('Westminster') to the Earl of Gainsborough, regarding the 'competency for the situation of House Steward' of Charles Seammen. Grosvenor House, W. [ London ] 15 July 1867. 4pp., 12mo. Bifolium. In fair condition, but with damage at head of outer sides caused by removal from grey paper mount. While Seammen worked for him he found him to be 'good tempered, obliging & trustworthy - He left me last year owing to an illness which, at the time, precluded his having the same efficient control over the Household that he had hitherto exercised'. He explains the reason for making 'a change', and is sending 'an excellent Character with him, of 14 years, from Lord Ravensworth'. [ Hon. Henry Erskine, Lord Advocate for Scotland. ] Autograph Letter Signed ('Henry Erskine') to Mrs Cockburn Ross, dissuading her from hiring Archibald Black. Princes Street [ Edinburgh ]. 30 January 1804. 2pp., 4to. Bifolium. In fair condition, aged and worn. Addressed, with red wax seal, on reverse of second leaf, to 'Mrs. Cockburn Ross | Pooles Hotel'. He begins by explaining why he has not replied to her letter sooner, his clerk having placed it 'with some Letters of Business'. Archibald Black, who was formerly in his service, is 'a good natured honest Creature', but he cannot advise her to hire him. On the poor mans account I would not wish to be more particular than just saying that it is not owing to any objection to his moral Character that leads me to dissuade you from engaging him'. [Peter Rylands] Autograph Letter Signed "Peter Rylands" to "Brooke Robinson" (Dudley lawyer?). [Printed heading] Bewsey House, Warrington, 25 Sept. 1871. Four pages, 12mo, remannts from tipping in album or similar, sl. grubby, text clear and complete. He discusses the previous situation of "John Gamble", a servant, who he says was 'trustworthy & obliging' in the few months he was employed by him., "He is not at all afraid of hard work but rather appears to like it but is somewhat rough in his manner & makes too much noise." He had to tell him off for this, and prefers quiet servants. Manuscript Victorian directions for a servant in a large establishment, giving twenty instructions, primarily regarding cleaning. 4pp., 16mo. Bifolium. On piece of watermarked laid paper. The first page reads: 'Not to call out to any of the servants but to go up to them when wanted or to ring the call bell. | Care about curtains & chairs - wear white cotton gloves to touch them with | Open shutters gently so as not to disturb the family. | Dont talk loud or laugh loud. - where there are many servants the noise is disagreeable & never allowed.' Towards the end: 'In setting your candle down see that there is nothing over it - such as a picture frame or ornament of any kind -'. Autograph Letter Signed ('Dalhousie') from George Ramsay, 9th Earl of Dalhousie, on going to India, to Mr Forbes of 76 Queen St, Edinburgh, giving character references of three of his servants (Wood, Thomas Robertson and Robert Combe). Dalhousie Castle [Midlothian, Scotland]. 16 April 1829. 3pp., 4to. Bifolium. In original envelope, with black wax armorial seal, addressed by Dalhousie to 'Mr. Forbes | 76 Queen Street | Edinr.' Very good, on lightly-aged paper. Dealing with his 'own Servant' Wood, first, he states that he has been with him for five years, 'in keeping my Cloaths, and my Butler latterly altogether; I have found him at all times sober, attentive active, and I believe him perfectly honest, & trustworthy. He has kept my house accounts, my Cellar Books, & all house matters regarding the men Servants, & that both at home and abroad to my satisfaction. William Hillier Onslow (1853-1911), 4th Earl of Onslow, British Conservative politician and Governor of New Zealand, 1889-1892. 23 June [no year]; 'by Richmond to Whitehall', on cancelled Clandon Park letterhead. 12mo, 2 pp. Twenty-two lines. Text clear and complete. Regarding his footman Alfred McCloud, who has obtained with the recipient 'as Messenger'. I have taken no steps to fill his place till now & in the middle of the London Season it may be very inconvenient to be without a footman'. His butler is 'taking immediate steps to secure a man', but he would 'be glad to know how far you could meet my convenience in waiting for A. McCloud until I am suited'. Four Autograph Letters Signed to the Secretary, Royal Society of Arts. Indian civil servant (1854-1935) whose posts included those of Under-Secretary to the Governments of Bengal and India. All four items signed 'Chas. S. Bayley'. All four items one page, 12mo. The last three, all on grey paper, very good; the first somewhat grubby and creased, and with two paperclip rust stains in one corner. LETTER ONE (addressed to 'Mr. 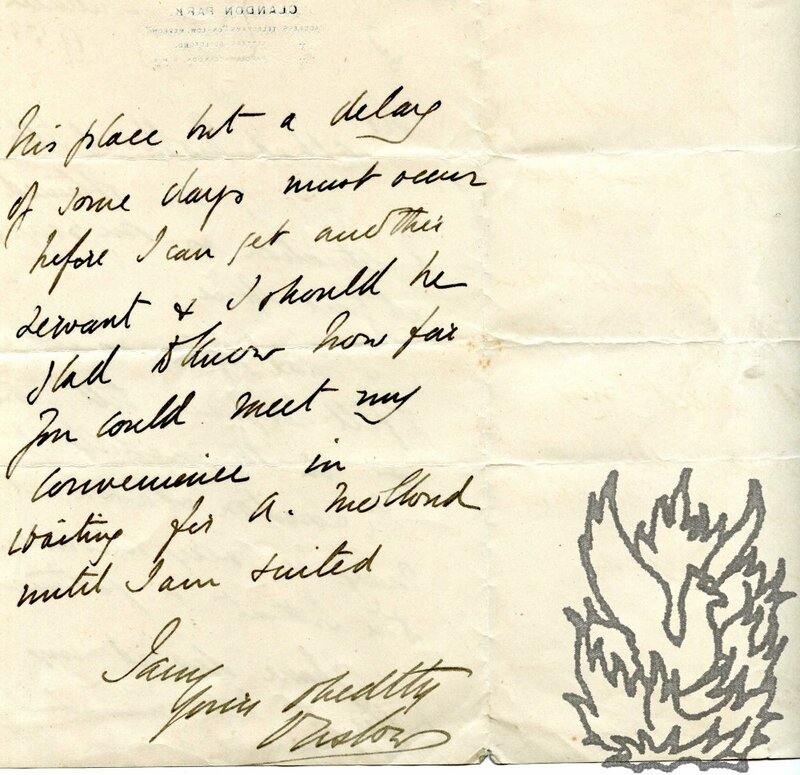 Digby'): He is returning Menzie's letter (not present) and feels sure that 'the Indian Section Committee will be pleased to learn that the Council have agreed to appoint a joint committee to consider the question of the Birdwood medal. 13 October 1869, Little Campden House, Campden Hill, with monogram letterhead. English actor (1814-1878). 2 pp, 8vo, neatly mounted. "James Brown has referred me to you for a character as a general in-door servant - I should be much obliged if you would let me know your experience of his abilities, and of his character for honesty & diligence and sobriety -"